MetroCount has a strong track record in the development, manufacture, sales and export of traffic survey equipment. In over 20 years of activity, the MetroCount trophy cabinet case has collected some prestigious awards. 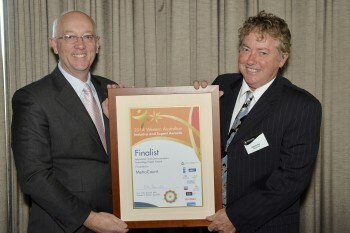 In 2014 we were included in the West Australian Export and Industry Hall of Fame. In 2010 MetroCount was awarded the Engineering Excellence Award for the development of our MC5712 unit. This product enabled the gathering of data at intersections to identify issues with driver behaviour and uncover potential hazards. Most recently, in 2017 MetroCount was a finalist in the WA Industry and Trade Export Awards. All these achievements would not have been possible without the efforts of our talented team and our commitment to customer care and sustainable development.